The stunning geometric lights, made up of dark blue clouds, turquoise dots and pale orange vapour trails, lit up the sky over the Norwegian Sea on April 5. They were the result of an experiment designed to study the processes inside the Earth’s “polar cusp”, where the planet’s magnetic field lines bend down through the atmosphere. It is here that the charged particles from solar wind cause aurora – the colourful natural light displays which appear over the poles during periods of solar activity. Scientists want to study exactly what happens during an aurora in the electrically charged and turbulent layer of the outer atmosphere which Nasa describes as a “tumultuous particle soup”. Their pair of rockets were carrying scientific instruments for studying the energy exchange during the phenomenon, and also deployed what they called “visible gas tracers”, between 71 and 150 miles altitude. The mixture of substances are similar to those found in fireworks, with chemicals which ionize when exposed to sunlight. The multi-coloured vapours produced “allow researchers to track the flow of neutral and charged particles with the auroral wind,” Nasa said. 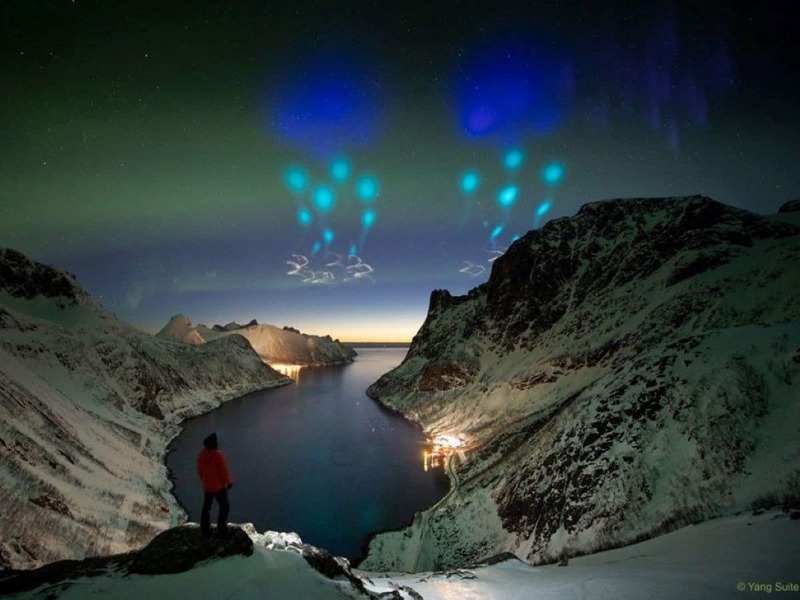 The project is called AZURE, which stands for Auroral Zone Upwelling Rocket Experiment, and was carried out by two black Brant I-A sounding rockets, which were launched from the Andøya Space Centre in north-west Norway. “By tracking the movement of these colourful clouds via ground-based photography and triangulating their moment-by-moment position in three dimensions, AZURE will provide valuable data on the vertical and horizontal flow of particles in two key regions of the ionosphere over a range of different altitudes,” Nasa said. Michael Theusner who captured a stunning time lapse of the kaleidoscopic illuminations, said: “While we were watching the after-effects of a beautiful northern lights display, the rockets were launched from the Andøya Space Centre only about 180 km away to the north.